Great value, well-built and delivers everything it promises. You're in safe hands with Denon. Robust build quality with jog wheel and pitch fader. Two deck control via single button press. Modular, flexible design that's easy to use. Endless rotary knobs. An additional mixer is necessary, so an all-in-one DJ controller may offer a simpler solution. Yes, it's yet another option to consider while navigating the torrid seas of digital DJing, but the more the merrier we say. 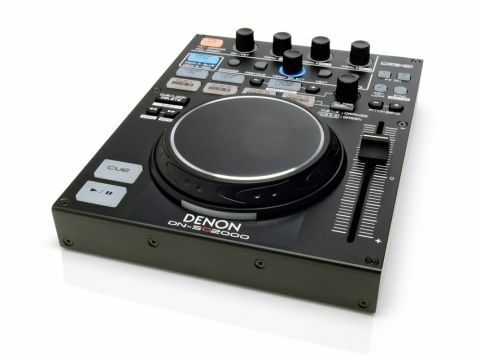 Rather than the ubiquitous dual deck, audio interface all-in-on solution or the just-as-popular MIDI-only-two-decks-and-a-mixer type machines, Denon has built the SC2000 as a single jog wheel unit. This means the unit can be used between both deck A and deck B by simply hitting a button. The DN-SC2000 is built fabulously, with a sturdy steel shell and rock solid jog-wheel instantly pleasing to the touch. The unit is fairly weighty and will either be a reassuring reminder of quality or something that you have hard feelings about having to cart around everywhere. Then there's those lovely Denon buttons, backlit, slightly rubberised but tough and with a pleasing click when pressed. Testing the unit with Traktor and a TSI mapping file downloaded from the Denon site, the unit was up and running in seconds and it's quite hard to flaw the unit for deck, effects and track selection. Obviously, you will need a separate controller for Traktor's mixer, or a hardware mixer for the full DJ experience but nearly every other task is taken care of via the Denon's controls. Track selection is quick and obvious with a central rotary used for scrolling and selection, while separate browser, previous, next and duplicate buttons are there for other duties. Hit the duplicate button and the track loaded in to the active deck A matches the track in the deck B and vice versa. A quick and simple way to pair up tracks for clever scratching tricks or re-edits on the fly. Sadly, rotaries on the controller are of the endless variety. Usually we are massively against endless rotaries on anything performance-based, but because these rotaries as push buttons too it's easy to filter then push to turn off. It does mean, however that because there are no lights around the knobs, you do have to spend a little extra time starring at the laptop screen to make sure you know where the filter and effects settings are positioned. Colour coding on the backlit buttons also helps navigating between deck A and deck B and the two separate FX units, which change between either orange or green glows. We really enjoyed using the DN-SC2000 and for the small price tag it's a flexible and professionally built bit of kit. We can see it being appealing to people who were considering Native Instrument's X1 but like the idea of a jog wheel and pitch fader. Having your DJ setup modular can sometimes be a hassle, but for anyone who plays in a variety of different sized DJ booths and venues, will find this small deck a treat. The only thing to consider is if you end up buying two of these and a suitably professional audio interface there are many, many other options to consider for the price. As a stand-alone solution though, it does exactly as it promises and is built like a tank. Hurrah!